The new Georgia Agriculture license plate to honor Georgia Agriculture is now available. You can purchase one by calling or visiting your local county Tag office. The idea for the agriculture tag's design came from FFA and 4-H members attending the Governor's Honors Agriscience Program. The students researched other states' agriculture tags and came up with their own ideas of what should be on the tag. The students completed a draft design. Mike Parsons, an artist from Winder, took their draft design and created the final design for the agriculture tag. In November, Georgia voters approved a constitutional amendment authorizing specialty tags by a 67%-33% margin. Included in this amendment was the "Ag Tag" proposed by Senator Greg Goggans of Georgia's 7th District. 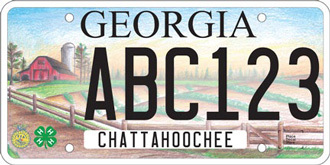 The new automobile license plate was designated to honor Georgia agriculture. Proceeds from the sale of the agriculture tags will go to benefit FFA and 4-H. The agriculture tags will be shipped to those who purchase one as soon as 1,000 tags are ordered. "We want to make sure that all Georgians recognize how important agriculture, agribusiness and agriculture education are to this state," said Sen. Greg Goggans of Douglas, who introduced the bill. "It is my hope that when drivers see this tag on the highway they will be reminded of the hard work that goes into putting food on our tables." We appreciate the actions of many people to support the passage of the legislation proposed by Senator Goggans. We particularly acknowledge the support of the Governor's Agriculture Advisory Committee, and General Assembly members in both chambers. The tags can be pre-purchased now. Visit or call your local tag office and request the tag. If your tag clerk needs coaching to find the tag listed in a computer, the code is FH. There is an initial $80 fee which includes manufacturing cost and the annual fee for the tag for the first year. Once 1,000 orders have been placed, the tags will be manufactured and shipped to the purchasers. There is an annual $55 registration and specialty tag fee to renew. 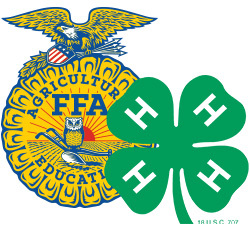 Ten dollars of that fee will be evenly distributed between Georgia 4-H and FFA and go to fund special initiatives in each organization for each year. Funds will be used to support work relative to the mission of each organization and to promote agriculture, agricultural awareness, and environmental education. Proceeds from the Georgia Ag Tag benefit Georgia FFA and Georgia 4-H.